We visited this park on August 29, 2017, and stayed for 8 day(s). We learned about South Park Mobile Home & RV Community from another campground owner when I expressed my frustration with finding a place to stay in Denver on short notice. 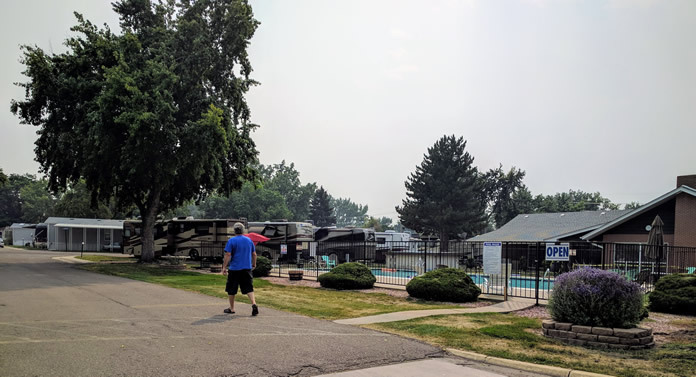 You’d think there would be ample RV parks in and around Denver, but that’s not the case and without a lot of lead time, it’s difficult to find a spot. We’re here to work the National Narrow Gauge Convention which will be held at Denver Tech, and this park is about 30 minutes away, the closest we could get. After a stressful drive through Denver, Google Maps took us right past the entrance to South Park – and had I not noticed its sign on the left, who knows where it would have taken us. After a quick detour through a residential area, we were back at the entrance to the park. South Park Mobile Home & RV Community only recently opened one row of their park to RVs. The rest of it is a nicely landscaped mobile home park. They like their speed bumps here; take it slow and easy as you drive in or you’ll have nothing left in your pantry. The office is in the middle of the park. Tiny signs point the way to an RV staging area, and the office is just beyond it on the left. Community Center with pool tables, lending library, card room. We have good over-the-air TV and a strong AT&T signal. Our Verizon phones are only showing two bars – better than nothing, but thankful we don’t have to rely on them as hotspots. For more information, visit South Park’s website. Update: We returned on October 26, 2017 for another five nights. It’s a convenient place to stay while we attend work-related events in the Denver area.